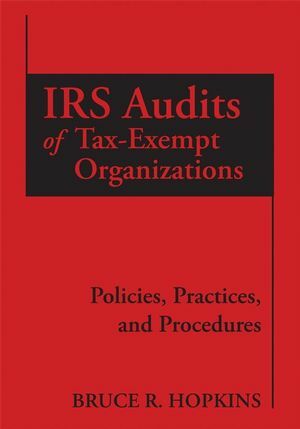 Written by Bruce Hopkins, the foremost expert on nonprofit law, this is your complete analysis of the procedures and practices of the IRS in its audits of tax-exempt organizations. 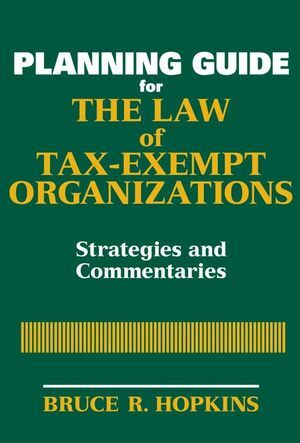 Practical in presentation, this book offers advice on undergoing audits, details today's exempt organizations' issues, and authoritatively examines detailed documentation and citations, as well as numerous case studies, tips, forms, and checklists. Bruce R. Hopkins is a senior partner with the firm Polsinelli Shalton Flanigan Suelthaus PC. He is also the author of more than 20 books on nonprofit tax and law issues, including The Law of Tax-Exempt Organizations, 9th ed., Planning Guide for the Law of Tax-Exempt Organizations, Nonprofit Law Made Easy, Charitable Giving Law Made Easy, 650 Essential Nonprofit Law Questions Answered, The Law of Fundraising, 3rd ed., Private Foundations: Tax Law and Compliance, 2nd., The Tax Law of Charitable Giving, 3rd ed., The Law of Intermediate Sanctions, and The Law of Tax-Exempt Healthcare Organizations, 2nd ed., as well as the monthly newsletter Bruce R. Hopkins' Nonprofit Counsel, all published by Wiley. 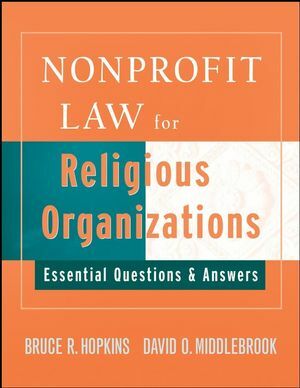 Mr. Hopkins received the 2007 Outstanding Nonprofit Lawyer Award (Vanguard Lifetime Achievement Award) from the American Bar Association, Section of Business Law, Committee on Nonprofit Corporations. He is listed in The Best Lawyers in America, Nonprofit Organizations/Charities Law, 2007-2008. 1. IRS Audits of Tax-Exempt Organizations – Fundamentals. § 1.1 Introduction to IRS Exempt Organizations Audit Procedures. § 1.2 Reasons for IRS Audits. § 1.3 IRS Audit Issues – Introduction. § 1.4 IRS Audit Procedures in General. § 1.5 Tax-Exempt Organizations' Rights. § 1.6 Types of IRS Examinations. (b) Office and Correspondence Examinations. § 1.7 IRS Audit Controversy. § 1.8 IRS Summons Authority. (a) General Procedures in Exempt Organizations Context. (c) Contents of TAM Requests. (d) Handling of TAM Requests. (e) Appeals of Decisions to Not Seek Advice. (f) Withdrawal of TAM Requests. (h) IRS Use of TAMs. (j) Limited Retroactive Effect of TAM. (k) Future Use of TAMs. (a) Overall Purpose of Closing Agreements. (e) Closing Agreements in Exempt Organizations Context. § 1.11 Freedom of Information Act. § 1.12 Expansion of IRS Exempt Organizations Audit Activity. § 1.13 Current and Future Focus of IRS Exempt Organizations Audits. § 2.1 Structure of Department of Treasury. (a) Treasury Department in General. (b) Treasury Inspector General for Tax Administration. § 2.2 IRS in General. § 2.3 Tax Exempt and Government Entities Division. § 2.6 Customer Education and Outreach. § 2.7 Rulings and Agreements. § 2.9 Customer Accounts Services. § 2.10 IRS Administrative Functions. (a) Organization, Priorities, and Mission. (b) Appeals Function and Tax-Exempt Organizations. § 2.12 Office of National Taxpayer Advocate. (e) TAS and Tax-Exempt Organizations. § 2.13 Practice Before IRS. 3. Managing Tax-Exempt Organizations IRS Audits. (c) Review Books and Records. § 3.2 Winning Audit Lottery: Initial Steps and Reactions. (h) Office Facilities for IRS. (i) Initial and Other Interviews. § 3.3 Audit Unfolds: Ongoing Steps. (b) Stay Calm, Things Take Time. § 3.4 Power of Attorney. § 3.5 Interacting with IRS Examiners. § 3.6 Documents Likely to be Requested. § 3.7 Qualified Amended Returns. (c) Why Issues Are Elevated. (d) Elevation to Inform Managers or Executives. (e) Elevation to Obtain Decision. (f) Issues That Are Candidates for Elevation. (g)Referral to or Consultation with Counsel. (a) IRS District Office Action. § 3.10 Parade of IRS Forms. § 3.11 Statute of Limitations. § 3.12 An Unwanted Outcome. § 4.1 Compliance Check Projects Programs. § 4.2 Concept of Market Segment Study. § 4.3 Executive Compensation Compliance Initiative. (g) Lessons Learned and Recommendations. § 4.4 Political Activities Compliance Initiative. § 4.5 Hospital Compliance Project. § 4.6 Intermediate Sanctions Compliance Reporting. § 4.7 Fundraising Costs Reporting. § 4.8 Tax-Exempt Bonds Recordkeeping Compliance. 5. IRS Tax-Exempt Organizations Examination Procedures. § 5.1 Director, Exempt Organizations Examinations. § 5.2 Planning, Classifying, and Selecting Returns; Processing Claims. (a) Inventory and Classification System. (d) Joint Committee Claim Cases. § 5.4 Other IRS Pre-Examination Processes. (e) Beginning of Examination Process. § 5.6 Conflicts of Interest. § 5.7 Prohibition on Executive Branch Influence. § 5.11 Pre-Examination Procedures – Overview. § 5.12 Review of Return. § 5.13 Review of Accompanying IRS Documents. § 5.15 Research and Assistance. § 5.16 Case Chronology Record. § 5.18 Commencement of Examination. (d) Evaluation of Internal Controls. (n) Developing and Documenting Facts. (o) Collecting and Recording Facts. (p) Preparation and Issuance of Summons. § 5.20 Burden of Proof. § 5.21 Revocation of Tax Exemption. § 5.22 Effective Date of Revocation or Modification. § 5.26 Revocation Due to Inadequate Records or Failure to Provide Requested Information. § 5.27 Issues Subject to Declaratory Judgment. § 5.28 IRS Inability to Locate Organization. § 5.29 Technical Advisor Issues. § 5.31 Law Research by Examiners. § 5.32 Closing Letters; Examination Reports. (b) No-Change with Written Advisory Examinations. (d) Presentation of Issues in Examination Reports. (e) Revocation of Exempt Status. (f) Modification of Exempt Status. (g) Reclassification of Public Charity, Foundation Status. (h) Modification of Operating Foundation Status. (j) Private Foundation Excise Taxes. (l) Non-Exempt Charitable Trusts Examinations. § 5.35 Basic IRS Examination Forms. (c) Report of Examination (Tax Changes). (d) Report of Examination (Status Changes). (e) Excise Tax Audit Changes. § 6.1 Constitutional Law Background. § 6.2 Statutory Law Background. § 6.3 Statutory Law Overview. § 6.4 Inapplicability of Church Audit Procedures. § 6.6 Church Tax Inquiries. (b) Written Notice to Church. § 6.7 Church Tax Examinations. (b) Notice of Church Tax Inquiry. (c) Notice of Church Tax Examination. § 6.10 Two-Year Completion Rule. § 6.11 Ninety-Day Completion Rule. § 6.12 Special Limitation Periods. § 6.13 Limitations on Additional Inquiries and Examinations. § 6.14 Limited Remedy for IRS Violation of Procedures. § 6.15 Exhaustion of Administrative Remedies Rule. § 6.16 Interplay with Intermediate Sanctions Rules. 7. Tax-Exempt Organization Examination Issues. § 7.1 Categories of Tax-Exempt Organizations. (b) Charitable, Educational, and Like Organizations – General Rules. (e) Public Interest Law Firms. (h) Amateur Athletic Sports Organizations. (j) Local Associations of Employees. (l) Agricultural and Horticultural Organizations. (n) Social and Recreational Clubs. (p) Voluntary Employees' Beneficiary Associations. (q) Teachers' Retirement Fund Associations. (r) Mutual and Cooperative Organizations. (w) Supplemental Unemployment Benefit Trusts. (y) Black Lung Benefit Trusts. § 7.2 Public Charity and Private Foundation Status. (a) Donative Publicly Supported Organizations Issues. (c) Service Provider Publicly Supported Organizations Issues. § 7.3 Nonexempt Charitable Trusts and Split-Interest Trusts. § 7.4 Unrelated Business Activities. (a) Advertisements of Fundraising Activities. (b) Disclosure of Nondeductible Contributions. (c) Disclosure of Quid Pro Quo Contributions. (c) Analysis of Bingo Activity. (d) Analysis of Pull-Tab Activity. (f) Qualification for Exempt Status. A. Sources of the Law. B. IRS's Good Governance Principles (draft). C. Summary of the Law. Table of IRS Revenue Rulings. Table of IRS Revenue Procedures.